I was checking out Dennis’ cooking team during Wednesday supper at church. The team was preparing bourbon-brown sugar pork and jerk pork on Dennis’ big portable BBQ rig. 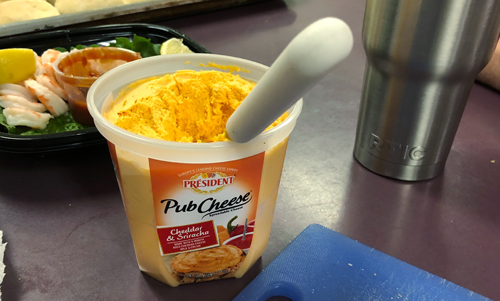 Inside he had some Président® Pub Cheese with Cheddar and Sriracha he had picked up at Sam’s. It paired nicely with some Turley Zinfandel Juvenile Vineyard 2013. But then again everything pairs well with a Turley Zin. Nice creamy cheese that is creamier than it looks. It looks like it’s going to be stiff and chunky looking at the perceived texture. But it is like soft butter. Here’s what their website says: Sriracha has quickly become everyone’s favorite source of heat. When combined with the smooth taste of 9 months aged cheddar, milk, and cream, this flavor is an instant classic.